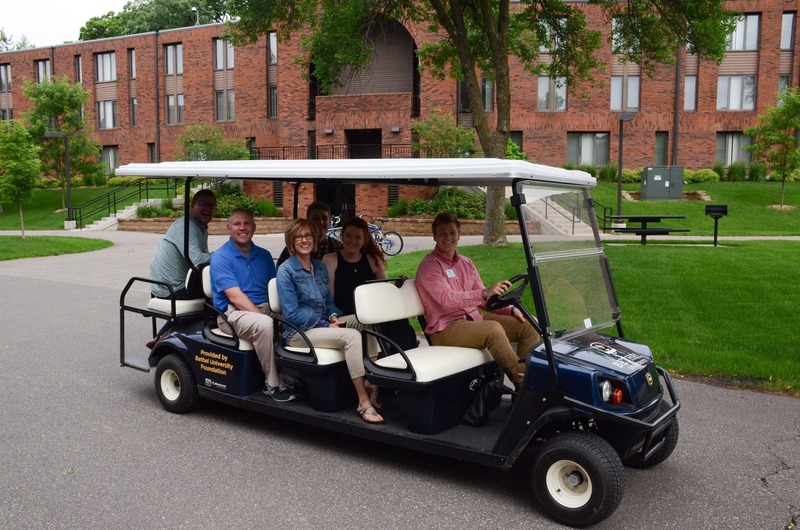 June 15, 2018 | 1:30 p.m.
Bethel Admissions received one of the first ever Bethel Foundation Strategic Growth Awards in 2017, which funded this 8-passenger golf cart for campus tours among other enhancements to the campus visit experience. Last year, the Bethel Foundation introduced the Strategic Growth Award competition to fund initiatives to enhance the university’s enrollment and affordability. In its first year, two projects were funded, one from undergraduate admissions and the other from the business department. This year the foundation doubled the number of awards offered. “There was a very diverse group of applications,” Grants Manager Pamela Buchanan says. “The board was excited to see such a well-rounded group.” Out of a pool of 14 proposals from across the university, four were chosen. Developing Bethel’s future leaders before they even start classes and working to eliminate textbook costs for Bethel’s associate programs are just a couple of the innovative plans in place for the coming years. While the hallways may be busier during the academic year, Bethel is no stranger to hosting a variety of groups during the summer months. Come June 2019, the Office of Student Life will welcome prospective Bethel students for a one-day student leadership summit. Prospective students will have the opportunity to hear from nationally recognized faith leaders, sit in on a presentation from Admissions, and participate in discussions that will offer a preview of what it’s like to learn and grow in the Bethel community. Kirchoff says they’re still in the developing stages and the conference has yet to be given an official name. But the hope is next June’s summit is only the first of many yearly gatherings of student leaders. “Universities are seeing this dilemma where textbooks cost so much that students aren’t buying them,” says Earleen Warner, reference librarian. Studies have shown that these high-cost resources are also causing students to take fewer courses, drop courses, or not register for courses all together—and Bethel students are no exception. 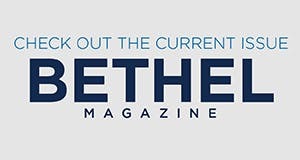 This grant allows a team from Bethel University Library, a dean’s office in the College of Adult & Professional Studies (CAPS) and Graduate School (GS), and staff from other offices in CAPS and GS to work together to eliminate textbook costs in select programs by replacing standard textbooks with Open Educational Resources (OER) or with eResources already available through the Bethel University Library. These resources could include textbooks, readings, videos, presentation slides, assessments, and other educational material. The initiative will begin with a two-year pilot project in Bethel’s associate degree programs. In the first year, reference librarians and faculty will be trained in locating high-quality OER and eResources, supported by a membership to the Open Textbook Network and a subscription to Intellus Learning. Changes will be made to course curriculum, and by the second year those changes will be implemented. “We are hoping to ultimately advertise that our A.A. and A.S. programs will be zero cost in terms of textbooks,” Warner says. After evaluating the pilot project and making any necessary adjustments, the initiative plans to move forward to other CAPS programs. Sometimes enhancing affordability and enrollment means increasing accessibility—and that’s what the undergraduate admissions office is working on in partnership with Hmong College Prep Academy (HCPA) in St. Paul. This Strategic Growth Award will help fund a shuttle that will run between the university and the charter school three times per day. According to Bret Hyder, director of undergraduate admissions, the number of students from HCPA who will attend Bethel has increased from one PSEO student in 2017-2018 to 14 students who have committed for this fall, and from zero traditional undergraduate students to two. “A lot of that’s due to us floating this idea of a shuttle past their administration, and the administration getting us their best and brightest kids that they can find,” Hyder says. In addition to the shuttle, which will begin operating this fall, the grant will also provide funding to host HCPA’s 11th grade class for an event on campus next year. Through these initiatives, admissions hopes to continually increase the number of HCPA students joining the Bethel community in the years to come. “This only works because it’s such a partnership, and the administration at Hmong College Prep Academy has just been so good at working with us,” Hyder says. Through the education department, Bethel University is the charter school authorizer for Hmong College Prep Academy. In addition, Christianna Mai-Choua Hang, founder and superintendent of Hmong College Prep Academy, earned her Ed.D. in K-12 Administration from Bethel in 2011. In recent years, Bethel Athletics has hired graduate assistants to help support several programs, including men’s basketball, women’s basketball, men’s hockey, and softball. After seeing the ways graduate assistants increased the bandwidth of coaching staff, Athletic Director Bob Bjorklund sought funding to bring two more on board. The grant allows for two graduate assistants to be hired for a two-year period. Each would receive a $10,000 stipend in addition to free tuition upon admission to a Bethel graduate program. The athletic department hasn’t determined which sports teams the graduate assistants would work with, but some general duties will include recruitment of student athletes, organization and planning of practices, game preparation, and nurturing the overall physical and spiritual development of student athletes. Learn more about how the Strategic Growth Awards came to be.